Not only are New Mexico’s public golf courses ideal spots to practice your swing, but most of them are situated among beautiful scenery and seclusion. 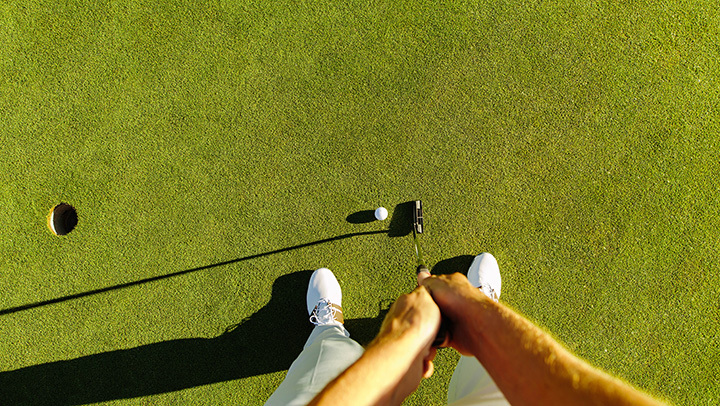 Whether you’re an avid golfer or just starting out, you’ll find something to suit your skill level. Get some peace and quiet while you tee up at these 10 great public golf courses in the state. The handicap at this public course has little to do with golf and everything to do with the its nat-ural beauty, a challenging distraction throughout all 27 holes. The rugged terrain tests golfers of all skill levels as does the 7,000-foot elevation. The course length is between 5,000 and 7,000 yards and runs through ponderosa, pine and juniper and up-and-down the mountainous land-scape. Long fairways, deep sand traps, smooth greens continue to make this the top golf course in the state every year, bringing acclaim from a wide-range of golf experts. A traditional links course is styled after the courses found along the barren coast of Scotland. This course is clearly not found near a shore, but it’s considered a modern links course because it’s relatively flat with very few trees and a mild rolling terrain. With four sets of tees, the 6,700 yard 18-hole course is manageable for golfers of all skill levels. Get a few swings in before you play at the driving range, or putting and chipping green. Rental clubs and carts available. Play year-round, weather permitting. The green fairways may be easy to see on this course surrounded by desert, but they are a real test of skill and finesse. The 18 holes wind across grassy knolls and along bluffs and in-an-out of juniper and pinon pine forests. Finesse is the word of the day to stay on par on this winding course. Greens and fairways are well-manicured making for efficient play. Get some practice in before your round at the on-site putting green and driving range. Hit your drive from five different tees—red to gold—on the 7,000-plus yards. You’ll find one great golf hole after another on this course, considered one of the best in the Four Corner’s re-gion. Sandstone canyons, deep arroyos and the desert landscape are integrated into this multi-tee golf experience. Walk or take a cart from green to green. There’s a driving range, pitching and chipping area and a putting green for pre-game practice. A fun, friendly and affordable place to shoot a round. A golfer’s oasis of long, wide fairways, pristine greens and silvery white bunkers, make this a walker-friendly course. Shooting a par 72 is demanding, though; the course has a 270-yard par three, a 520-yard par four, water hazards on the back nine and a final hole that with a blind green demands a precise two stroke approach. The signature first hole, a 539-yard par 5, doglegs left and then rolls downhill to the green and is approachable in two if you finesse your drive. Beauti-ful vistas of Albuquerque add to this parkland experience. R. Trent Jones Jr., one of the preeminent golf course architects in the world, designed this course based on his belief that a course should be “of the earth … and for the spirit.” He captured the essence of that statement in this course. The setting, a high desert terrain at the base of the Jemez Mountains, is spectacular and the manicured fairways, playable rough and contoured greens add to the beauty of the day’s game and the pleasure of playing this course. But watch out for the 61 bunkers scattered around the course, they’re tough to get out of. There are two options here, an 18-hole championship course and a nine-hole par 3 known as The Great 28. Both are designed for golfers of all skill sets, but, of course, the championship one pits the golfer against the relatively flat, flat fairways of Bermuda grass and the bent grass of the greens. Tee-up at any one of five sets for drives at this 7,000-plus yard course. The Great 28 is just right for practicing a short game or for a round of foot-golf. There’s a 35-station all grass driving range plus practice greens and putting area. Open year-round weather permitting. Golf Digest named this course one of the top 10 in the state for three years running and it was voted best course in Las Cruces by the readers of the Las Cruces Sun News. There are five sets of tees on this 200-acre course, 100 acres are turf and 50 acres each of native grasses and natural desert. Hazards include five lakes that golfers must navigate on eight holes, and 75 bunkers. The links-style course rolls out across 7,500-plus yardage. Book a tee time online. Special rates for seniors, active military, students and first responders. This public golf course is part of the 1,000-acre Turtleback Mountain Resort that sits at the base of its mountain namesake. The course was designed to blend the best of the high desert with a top-notch golf experience. It’s a regulation 18-hole championship facility that has a putting and pitching green, practice range, golf instruction and rental availability of carts, pull carts and clubs. The Santa Clara Pueblo is home to this high desert links course that winds along sandstone ridges and across native arroyos. At an elevation 5,400 feet, 12 of the holes head moderately downhill. Amenities include a driving range, two practice putting greens, a short-game practice area and a pro shop, and if you don’t want to walk, take one of the state-of-the-art GPS golf carts. Open year-round from dawn to dusk.